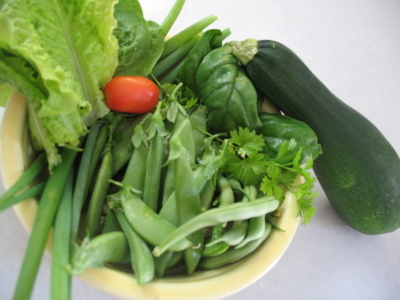 Whenever I talk about growing my own food, a list of benefits always enters the conversation - either the lack of pesticides/chemicals (I don't use any), the "knowing where your food came from" aspect, the closeness to source, but in fact, I think my favorite benefit is that it's fun. Fun for the whole family, really. 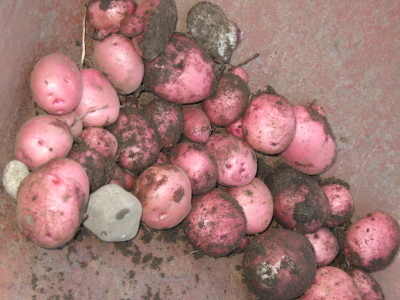 Last week, it was time to dig up our red potatoes. I don't know if this happens to most people, but my wife and I often buy more food than we need at the moment (bulk = cheaper). This is fine when it comes to canned and boxed foods, but when it comes to potatoes, this means that I end up with a bunch of shrivled potatoes with shoots extending all over the place in our pantry. So, I decided to take all of those potatoes and plant them in two of my garden plots. Here, you can see me and my three daughters and two of my young cousins (visiting from Korea) digging up one of the boxes. You can see a few green plants still standing on the plot, but they're basically done. 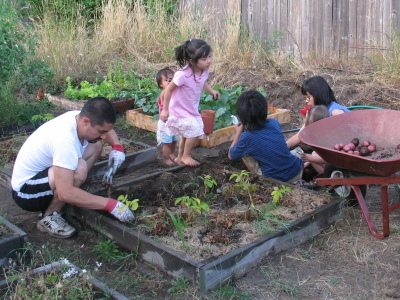 The kids had a blast -- it turns out that they enjoy digging up spuds more than picking snap peas. Mmm red potatoes. And some rocks. My 1-year old didn't quite understand the process, but she meant well. I think I'll let the other plot rest and just let the potatoes do their own thing for next year... although I might want to increase the size of the box. Potatoes are very easy to grow, so I might as well give them some more room to do their thing. We'll see. I love the big rock in with the potatoes. So very cute. I sure do love having kids. Rules: Don't spam. Don't harrass. Don't be a jerk. Your IP address (3.84.182.112) will be logged.